That easy smile. The bright, joyful eyes. The sweet calmness of an easy summer day. This picture could easily be a vintage family photograph; a snapshot from a joyous party or a farmer, just come in from the his fields, enlivened by the good work his hands. Instead, it is a picture of a man about to die. So who is this man and why is he smiling? 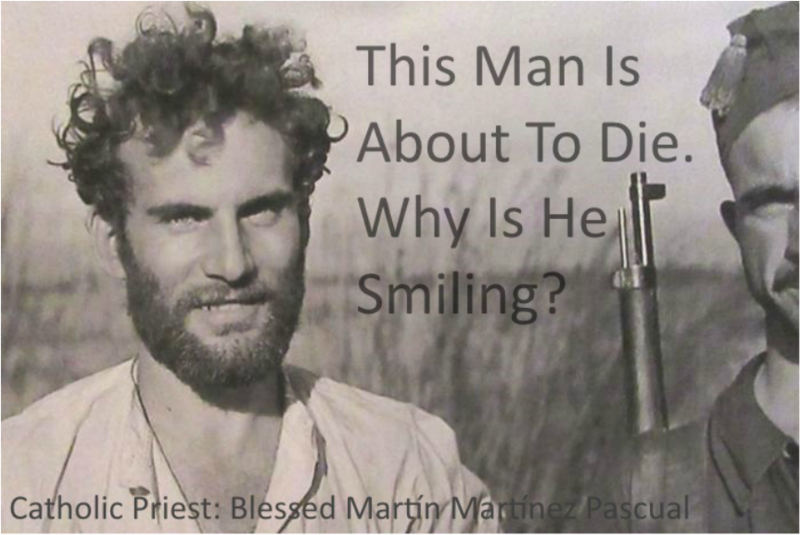 The man is Blessed Martín Martínez Pascual, a young Spanish priest of just 25 years, about to be executed only for being a Catholic Priest. He was the son of a Spanish carpenter, baptized at one day, and grew up a very devout child. He became a priest and joined the worker priest movement in Spain before he began teaching in the seminary Colegio San José de Murcia, teaching Latin in the seminary in Murcia, Spain where he was considered an excellent instructor, beloved by his students. When the terrors of the Spanish Civil War began, Blessed Martin took all of the consecrated hosts from the chapel, and went into hiding living in barns, caves, and haystacks. He evaded the militia for a few days but was caught and imprisoned where he spent his remaining time ministering to other prisoners, hearing confessions, and distributing the Eucharist he had rescued. ​Then he shouted “VIVA CRISTO REY!” LONG LIVE CHRIST THE KING! Right before being shot, he smiled for the photographer, a Republican, called Hans Guttman, who took a couple of photographs of him. In his eyes, you can see a foretaste of eternity. You can see the joy of a faithful priest. Blessed Martin was beatified on the 1st October 1995 by Pope Saint John Paul II. His feast day is the 18th August. Blessed Martin, Ora Pro Nobis! Viva Christo Rey!